Sharing in Notejoy happens with team libraries. You can't share from your personal library, so make sure to first create a team library. To share a team library, click on your team library in the sidebar. Then press the red Invite button that shows up on the right. 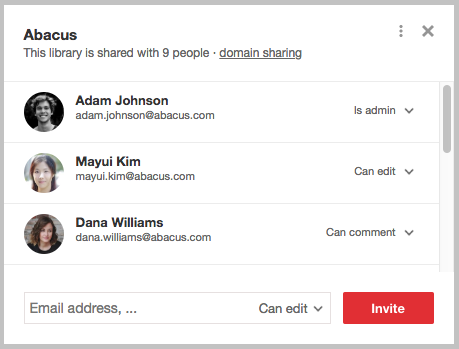 When you invite a team member to join a team library, you will also have the ability to set their Sharing Permissions to grant or restrict access. Available permissions are: Is admin, Can edit, Can comment, or Can view.